APA Research Report 154 and how to read it is based on extensive testing of shear walls and measures a shear wall’s ability to resist earthquakes. The amount of earthquake force a shear wall can withstand is measured in pounds for each linear foot of shear wall. This force is determined by using the base shear formula. The footnotes at the bottom of Table 1 describe how shear walls must be framed to produce the strongest shear walls possible. This earthquake resistance of shear wall is measured in pounds “per linear foot”, abbreviated as plf. The shear wall tables are now found in the American Wood Council’s 2008 Special Design Provisions for Wind and Seismic. The table below is from a previous edition of the California Building Code, and is more or less the same. If you have not already done so, please read the page mentioned above on how to understand shear wall tables. The following is a more detailed repetition of the same material. For example, in Table 1 below, if we look under “Panel Grade” we are told what the type of plywood is being tested. Under “Minimum Nominal Panel Thickness” we are told the thickness of the plywood. Then we find nail penetration, nail size and type of nails being tested, and finally under “Nail Spacing on Panel Edges” we see the distance between the nails on the Edges. This means the top, bottom, and sides of the plywood will all have this edge nailing spacing. At all other locations “in the field” spacing of the nails is 12″, no matter how thick or edge nailed the plywood is. The numbers found in Table 1 tell us how much earthquake force a certain nail spacing, type of plywood, and thickness the shear wall can resist. For example, on the top row we are told 5/16 inch thick plywood, nailed 6 inches apart with 6d common nails that penetrate the wall framing 1 1/4 inches, will resist 200 plf (200 pounds of earthquake force per linear foot). If nail spacing is 3 inches apart on the edges, it will resist 390 plf. Remember, unless otherwise noted, in all circumstances nail spacing is always 12 inches apart everywhere except the edges. This table, with slight modifications, is the basis for all shear wall ratings in United States building codes. 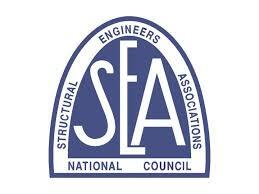 APA Research Report 154 is therefore a “must understand” test report for anyone doing seismic retrofit work. Except for “sheathing over metal framing,” these types of of shear walls often come into play in wood frame seismic retrofit work. In the tests in Table 1, blocking was placed behind all abutting horizontal plywood seams where one piece of plywood is placed against another and both pieces of plywood received edge nailing into the blocks. The APA did tests on shear walls where this blocking is missing and the plywood is otherwise properly nailed. This test is very relevant to seismic retrofit professionals because blocking is often missing where two pieces of plywood meet on horizontal seams. 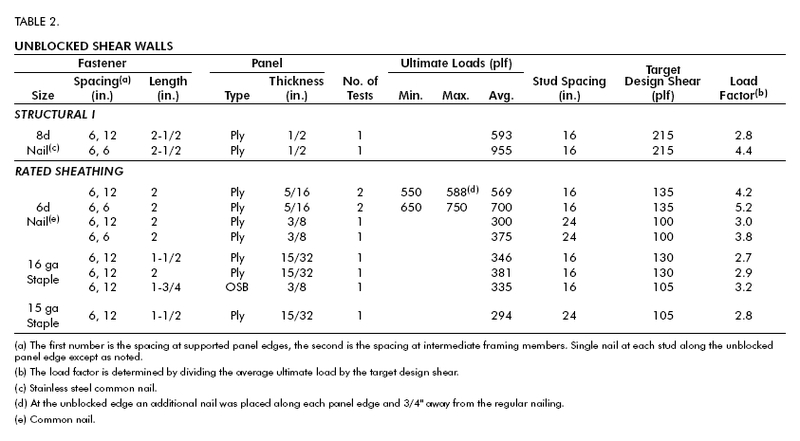 The results of these tests on un-blocked shear walls are in Table 2. “Ultimate Loads” means the point of failure in the test. “Allowable Load” is the value the code allows in designs. Allowable load is what one must use in retrofit designs. Stapled shear walls are used to prevent splitting of short or brittle framing members, such as when blocks are used on the mudsill or the cripple wall studs are 24 inches long or less. Such repairs are often required on existing retrofit shear walls because a very large percentage of them have over-driven nails. This is because many carpenters do not understand the importance of proper nailing techniques and/or have nail guns that are suitable for framing only. High capacity stapled shear walls. In addition, sometimes it is necessary to install very high shear capacity shear walls because of limited linear footage of foundation on a wall line. 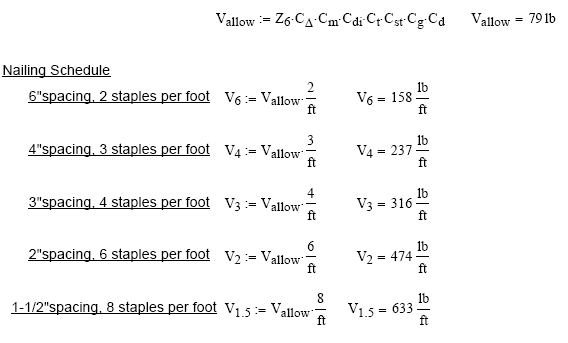 In Table 3 below, extrapolating from the value given 14 gauge staples being applied 1 1/2 inches apart on the edges, and 6 inches apart in the field, a single sided stapled shear wall will be able to resist 812 pounds per linear foot. Besides using these tabulated values, calculated values also confirm the ability of stapled shear walls to achieve high shear strength. In the calculations below, the 15 gauge staples were placed 1 1/2 inches apart. The staples could have been placed 1 inch apart with no risk of splitting the full 2-inch-wide old growth redwood and Douglas Fir found in old houses. This would have provided an even higher shear value than the 633 plf calculated shear value. 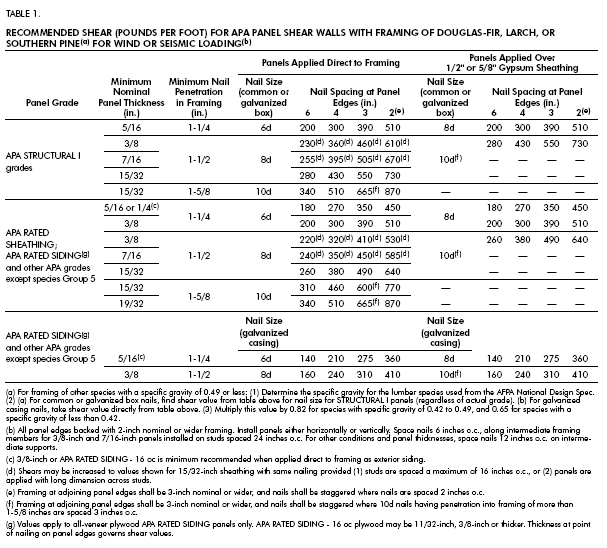 Page 10 of Report 154 states: “Double-sided shear walls are capable of developing extremely high shears” which can be readily seen in the table below. For some reason no test was done using 15/32 Structural 1, but one can extrapolate that the shear wall would be 10% greater than 980 plf shear wall using 15/32 Rated Sheathing. Though this is seldom done unless the back of the wall is accessible for bolt and hold down installation, shear walls built over gypsum is much cheaper than tearing out the existing gypsum and also allows retrofit shear walls to be built without interfering with fire code regulations. For unknown reasons, tests were not done using 15/32 Structural 1 plywood. Stud spacing is unpredictable on existing homes. Knowledge of how stud spacing and width affect shear wall performance is necessary. Stud spacings tested by the APA were 16 inches apart and 24 inches apart. Sometimes in retrofit work, stud spacings are found that are as much as 48” apart. In such cases, it is necessary to install new studs so that the stud spacing is no more than 24” apart. And finally, stud width was only significant where 2-inch nail spacing was on each side of a single stud. In these cases, there was a significant reduction in shear wall performance because of splitting of the framing. It is unknown what would happen if full 2-inch-wide old growth lumber were used. 1. Along with the findings of APA document TT-076, this affirms the importance of double studs at all vertical plywood joints.